Well this arrived today - and after half an hour of cleaning the most horrific layer of dust I've ever purchased - it's in pretty much mint condition - full working order and reset to factory settings as the patches the previous owner made are a bit crap, he was obviously trying to make sound alike patches. I'm hoping that it has a character of its own (the glitchy digital type) because is sounds bugger all like the stuff it was meant to emulate. lol how much were these back in the day? Probs a ton, I think. That would be a deposit on a house back then, mind. I had the 707 with the integrated expression pedal - I loved that thing Gigged it for years, never used the drive sounds but the modulation was pretty good. Should have kept it! 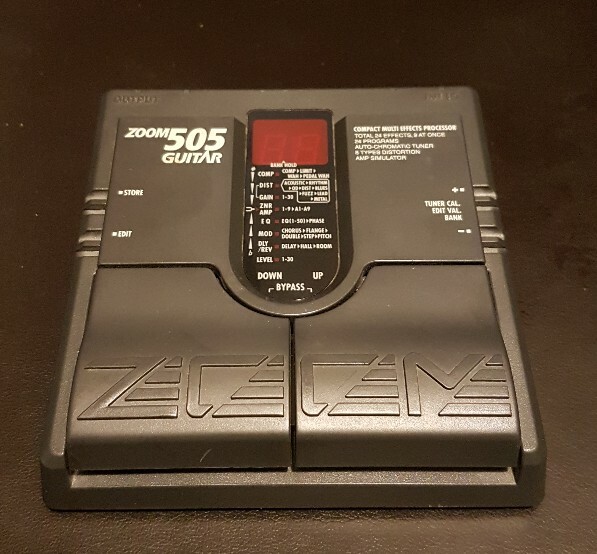 In the boring popular kids rock band I drummed for in 6th form, the frontman had a Zoom 3030. I get the feeling he was exclusively using presets, sounded like total balls, EVEN running into his sweet Hughes And Kettner solidstate halfstack. Still got the 505II. Cost £70 way back - soon bought a Boss GT6 since replaced with a pod hd500x. If you're patient (maybe desperate) you can get some useful sounds out of it. Only good points are it runs on batteries, has a decent tuner and is light - so I still use it sometimes for jam sessions when I know there are lots of stairs to climb and the sound ain't all that important. I had one of these bad lads, bought in mid-2006 for about ~£120 iirc. Used it almost exclusively for 3 years (switched to individual stomp boxes around the time I joined ShartScale). Continued recording through the USB output until 2014 because I was too much of a cheapskate to buy a proper interface. I'd be intrigued to know how much (if at all) the technology had moved on from the 90s models to this. Pretty massively I think. The Helix's are supposed to be mega good (including the drives). The Boss GT-Pro even though it's getting a bit older, has got some fantastic sounds in it. I've considered getting rid of stompboxes for a decent multi fx recently. 99% of the time, no one knows or cares about the differences in your sound. Plus the added flexibility/infinite sounds, coupled with ease of transport and set up is appealing. But I probably wont. Current multi-FX sound much better, certainly. But that Zoom jobbie of mine is nearly 15 years old! I have one still. It occasionally gets an outing as a drum machine /metronome. I don't think I've made best use of it. I tried the octave down ("BOOTSY" preset) once when we didn't have a bassist but it wasn't convincing. I still have mine. The presets are mostly shite, there's only about 2 usable ones and I've reprogrammed all the ones I can and wish there was more room, I didn't like the distortions at first, but they're pretty good if you use a valve amp and add a bit of modulation, a very slight amount which won't even sound like modulation but will make it sound less crappy. Also doesn't mix well with other pedals. Still cool in a way. I can get a 505 for free, I think it's not as tweakable though, just various levels of effects. It's a relative who wants to give it to me, but he won't let me try it out first. I'm not sure I want it, I have a lot of pedals. I got the MS-100BT a few years ago when I was in bedroom player mode and band had split, and it's great. Has pretty much been on my board since then, including with the reformed band...largely down to not being arsed to get my big board out again - this covers most things I need. Again, only really ever use it for non-drive sounds, but the Klon setting is a nice clean boost too. Noticed it has an input for an expression pedal - I take it it's for the two pitch effect settings that don't do anything at the moment. Only had a wee mess about with it so far but have come to the conclusion that Billy Corgan had one when they recorded 'Love' on melancholy as it sounds exact - and I've tried to get that sound a few times.